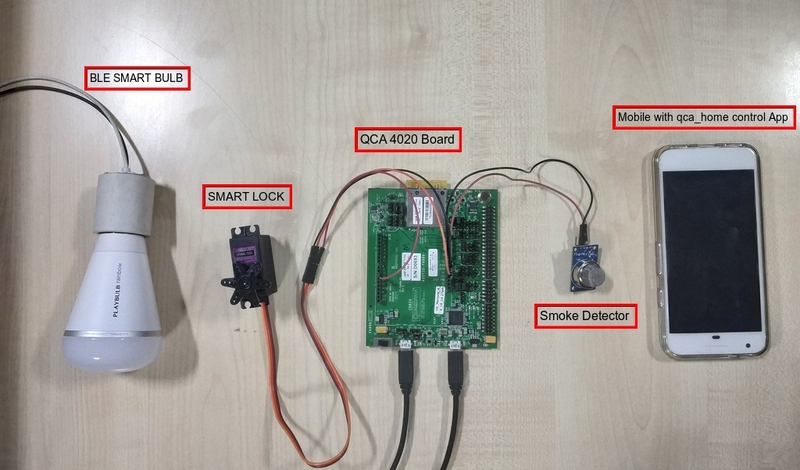 This project is designed to use the QCA4020 development kit to control a Smart Bulb, Smart Lock and Smoke Detector using a Mobile App via Bluetooth Low Energy (BLE) channel, and also demonstrates Home Automation. You can control the bulb, turn it on/off, lock and unlock, sense smoke and send data at regular intervals. The main objective is to develop a home automation solution using the QCA4020 board and BLE channel to control smart devices like a Smart Bulb (turn on & off), smart lock (lock & unlock) and smoke detector. These devices are controlled by an Android-based application which is installed on smartphones like a Google Pixel. Compile the code and flash the image as described in "QCLI_demo with QCA4020 Development Kit" project. The Home Control application on QCA4020 has the capabilities of locking/unlocking the doors, reading and sending the smoke detector values, and turning the bulb on and off via a mobile application. Sensors such as a smoke detector, BLE bulb and servo motor are connected to the QCA4020 development board. An Android mobile app controls these sensors by directly communicating to QCA4020 via BLE. The data from the smoke detector is monitored at regular intervals and displayed as a chart. Show / change the “Bulb” icon status in the app accordingly. The QCA4020 board is connected to the mobile app and the bulb via BLE. To make this happen, when connecting to the mobile, QCA4020 will act as Slave device which advertises to be discovered by the mobile application during BLE scan. And to get connected with the bulb, the QCA4020 board will act as Master device, and the bulb as a Slave device. The board application is implemented in a manner that it discovers the bulb with the name provided (explicit filter applied), gets connected in the background, and notifies its state to the mobile application. Smart Lock - BLE Properties set: READ and WRITE. WRITE property is given for controlling the device. READ property is for the getting the status of the device. NOTIFY property to notify about smoke sensed at regular intervals. In this application the values used to plot a graph for the user to check on the variations for the last. And the data of the smoke detector will be stored in the android application in for last active 1 hour. Smart Bulb - BLE Properties set: WRITE and NOTIFY. The Home Automation module is initialized for Home Automation service registration, which initializes Bluetooth and starts a thread to discover and connect the smart bulb via BLE. The following lines in /QDN_ControlEndDevicesApp/src/pal/pal.c, will reflect the above functionality mentioned. If bulb is active (connected to the board), the status sent is ‘1’ to the mobile application indicating bulb is ON. The status sent is ‘0’ to the mobile applications if the bulb is OFF. In the case of inactive (no bulb connected to the board), the status sent is ‘2’ to the mobile application so that the application disables the user interaction to the bulb to control. The application provides the necessary intelligence to notify the state to the application dynamically. Once the Application is connected to QCA4020, a thread is created to read the smoke detector values, and it is sent to the application every 30 seconds. If the connection is inactive the thread is destroyed.